Thanksgiving is not a Holy Day from God. It is a National Holiday created for the purpose of celebrating war victories. 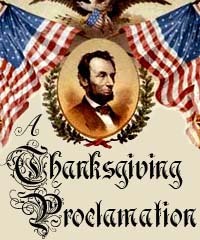 The Thanksgiving narrative taught today differs greatly from the original presidential proclamations. The “first Thanksgiving” in 1621, is portrayed as a three-day harvest celebration between the pilgrims and the Native American Indians. Most accounts neglect to acknowledge what happened next in history. The Indians were driven from their lands and massacred. This was hardly the start of a period to remember with thankfulness. The “discovery” of America turned into the start of many wars in a new land. Some say America stands for peace, prosperity and freedom. Yet here we are, almost 400 years after the “discovery” of America and the never-ending wars continue. The enemies may have changed, but the rallying cries from the leaders are the same, “We’re fighting to win”. No one turns to God. The American people are being led by men who have stated “God Bless America” over and over again, yet have not turned to God. They have turned to their military strength and the money on which they print “In God We Trust”. Instead of giving thanks for military strength and prosperity of the few achieved through wars and oppression, it is time to turn away from this false Holy Day and look to God. What does He want? For you to seek God and Him alone. How do you seek God? Read His Words. Previous Previous post: Why does God allow so much Evil in the World?